By Xah Lee. Date: 2016-06-15 . Last updated: 2016-06-18 . It seems, the Page Up Page Down keys are introduced in IΒM Model M keyboard in 1986. Since, it becomes the standard. Looking at old terminals and keyboards, most don't have page keys. DEC VT100 Terminal does not have the page key. Space-cadet, Lisp Machine Keyboards do not have the page key. But later Lisp machine keyboard do have a key labeled Page. interesting, that the NeXT Computer Keyboard does not have the page key. seems most Apple's early keyboards, and many others of 1980s keyboards, don't have the page key. Do You Use Page Up/Down Keys? So, overall, its a tie. I think it reflects habit. 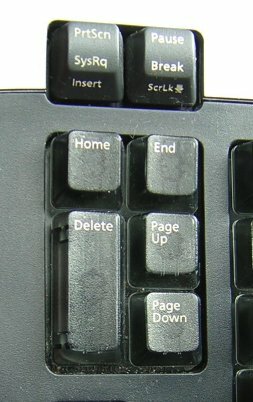 In the 1990s, most keyboards have page up/down key. Back then, it's unthinkable to not have page up/down key. There are few trends that caused the page keys to disappear. Apple laptops don't have page keys. Google's laptop the Chromebook, introduced in 2011, and becoming increasingly popular, don't have page keys. Laptop sales surpassed desktops since 2008. 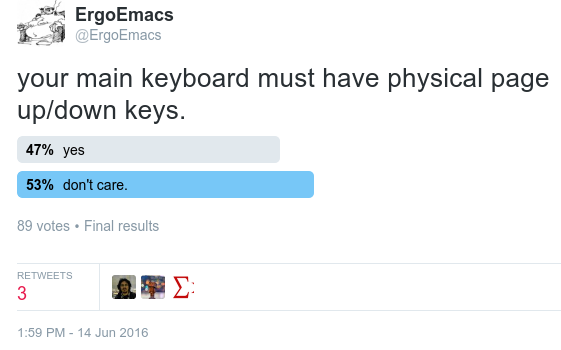 So, people get used to without page keys. Related is the arrangement of the Home/End key clusters. I recall, when i first used the 2 columns arrangement, i really hated it. But after 2 years , the traditional 2 rows by 3 columns becomes awkward. Is the Page Up/Down User Interface Good? In the past few years, i've concluded, that page up/down key, and moving screen content by screenful, is not a good user interface. That is, i think if we start from scratch, keyboard should not have a page up/down key. But rather, a scroll wheel type of control. Because, moving by screenful in discrete steps is really unnatural and awkward. Often, after you page up/down, you have to use arrow keys to adjust so that the interesting content is in the middle. This is particularly so today when page has lots images. (such as twitter) With page up/down, images often ends up cut-in-half. Another problem with page up/down keys since ~2010 is that, frequently in browser, they don't work, because the focus is in the URL field or search box. It's annoying that you press Page Down nothing happens then you realized the focus in elsewhere that you have to reach for mouse and click on the main window then Page Down again. I think the reason we have page up/down key, is because in the past technology isn't mature enough to have any other way to navigate screen. Mouse wheel isn't invented/popularized till Microsoft's IntelliMouse in 1996. Apple adopted a scroll wheel since Apple Mighty Mouse in 2005.